Learning vocabulary thematically helps students remember new words more easily. Repetition that’s varied and engaging is also helpful. The lessons in our Word Bank are grouped by theme and contain eight pages of fun, colourful exercises each! 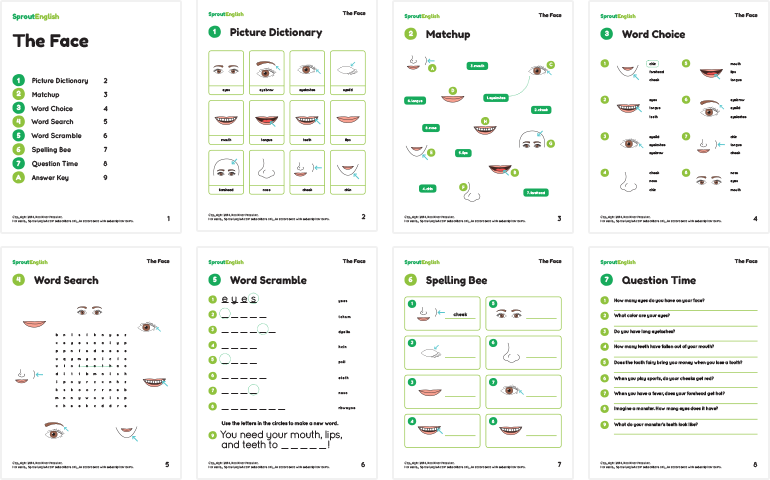 We’ve just created a NEW vocabulary lesson for your young learners on The Face. The Face includes a colorful picture dictionary, matchup, word choice, word search, word scramble, and spelling bee. This lesson covers all the basic parts of the face as well as some more detailed parts such as eyelids and eyelashes. Discussion questions at the end allow your students to practice the new vocabulary in context. Find this lesson in the Word Bank – Describing People & Things. Try our Body Parts lesson as a follow-up to The Face. Also, check our blog on Tuesday and Thursday for related activities.